Topics: Mayflower Transit, Free, No Obligation Estimates, and No Obligation Estimate. Rackspace Hosting Texas is the location of the Apache/2 server. ns6.myimatrix.com, and ns5.myimatrix.com are its DNS Nameservers. 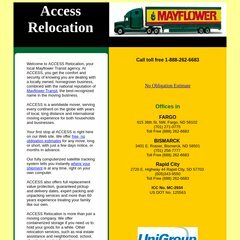 Access-relocation.com's server IP number is 72.3.253.84. PING (72.3.253.84) 56(84) bytes of data. A ping speed test response, is timed at 54.0 ms.